Big K.R.I.T. 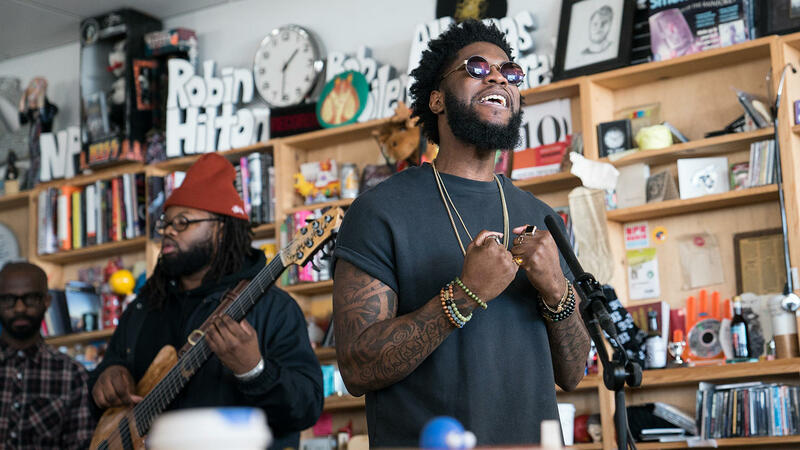 performs a Tiny Desk Concert on Feb. 8, 2018 (Jenna Sterner/NPR). Grandmothers never truly die. Especially not when they bear as much influence on your life as Big K.R.I.T. 's grandmother has on his. The Mississippi spitter has kept her spirit alive through his music since his breakout mixtape, K.R.I.T. Wuz Here, which he released in 2010, the same year she died. So it only makes sense that he would bring her with him for his Tiny Desk concert. Halfway through his three-song set at NPR Music headquarters, K.R.I.T. stops to pull out an old-school tape recorder — the same one his grandmother would use to record him singing and reciting poetry as a child. "I have to feel like my grandmother was my first mix engineer," he says before pressing play to reveal him and his brother as kids singing a duet of R&B crooner Donell Jones' 1999 slow burner, "Where I Wanna Be." It's a sublime interlude — one that resonated so strongly with K.R.I.T. that he had to start his last song, "Bury Me In Gold," over to catch the proper beat. "I'm super emotional from this, too," he says, laughing in a moment so genuine it was only right to leave it unedited. K.R.I.T. 's Tiny Desk came on the heels of 4eva Is a Mighty Long Time, a double album in which he covers everything from blessings to depression while plumbing the carnal and spiritual depths of his own duality. All three songs performed here come from side two, titled after his birth name Justin Scott, as his grandmother refers to him on the cassette tape. Her voice isn't the only special guest in the building. K.R.I.T. 's backing band, which includes Burniss Travis II on bass and Justin Tyson on drums, also features on keys Bryan Michael Cox — the hitmaking producer and songwriter behind a slew of Billboard chart-toppers (Mariah Carey, Usher, Mary J. Blige). Together, the trio delivers stripped-down versions of the latest thought-provoking material in Big K.R.I.T. 's catalog. And when he stops to pay homage to his church-going grandmother before performing "Keep The Devil Off," it's clear that everything she instilled in him is keeping him alive, too. Producers: Rodney Carmichael, Morgan Noelle Smith; Creative Director: Bob Boilen; Audio Engineer: Josh Rogosin; Videographers: Morgan Noelle Smith, Maia Stern, Dani Lyman; Production Assistant: Joshua Bote; Photo: Jenna Sterner/NPR.